What are we so optimistic about? So brilliant in it’s simplicity! Happy New Year! I know, I’m a little late but being more efficient is totally on my list of 2010 goals so I’M WORKING ON IT OKAY. On the topic of resolutions, I have resolved to lose a little fat this year. I wasn’t planning on making this a goal, but plenty of holiday cheer in the form of cookies has made this a sad necessity. Well, necessary in that I would like to fit in my pants ever again. It’s cold. I need my pants. I can blog from my phone!!! My calorie counter is a vengeful calorie counter. After like 4 months of sitting next to a vending machine at work, I’m looking a little jollier than I like these days and with the big 3-0 birthday coming up in a couple months, I’ve decided to go back to the life of hard work and deprivation (except not really) and attempt to slim down back to my happy weight. Or at least my pants-fitting weight. Sprouting grains and beans is a fun thing I’ve started doing recently because, apparently, I do not have enough work to do. Kidding! Sprouting is really easy and the nutritional payoff is more than worth the tiny investment of time and care. Also, it’s kind of like having a little garden in your kitchen. A little stinky garden, but hey smell is temporary. Related: that is also how I make it though certain parts of DC. Man, and I was pretty optimistic about these damn cookies! Sometimes you just want a damn cookie, and a cold, crunchy gluten-free disk out of a bag is not going to cut it. I may have squealed LOUDLY at Shoppers upon seeing Betty Crocker gluten-free baking mixes (I know I made the other lady in the baking aisle very uncomfortable) and grabbed one of each like they were the One Ring and I needed the precioussss. Still clutching the boxes to my chest, I then one-handedly started grabbing more stuff I could throw into the cookie mix. Macadamia bits, white chocolate chips…I had a craving. 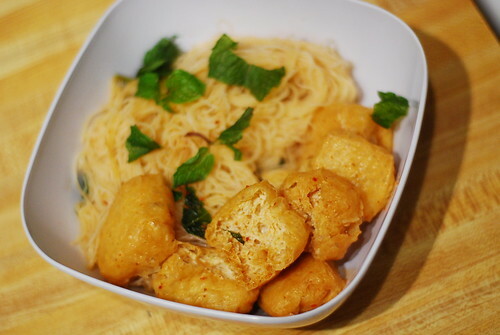 This individual serving of soy puff panang curry is a Saturday favorite at the Double Deuce. It’s fast, easy, tasty, and cheap. What’s not to love?